Today, I was asked to clarify some information surrounding an earlier post about Carrie Fisher and the role that anti-psychotic medications may or may not have played in her death from a heart attack. I appreciated the question which was about whether I’d seen the statistics put up by the Mad In America (MIA) blogger who wrote about Carrie Fisher (the blog which, incidentally, Dr Leaf had then uncritically decided to slyly try to regift it in the form of her newsletter article). In the opening of her post, the MIA blogger said, “There’s an important question here. Is she one of the cases in point to explain why our community has a 25 year lower life expectancy?” and then threw in a table plucked out of context from a journal article. At least, unlike Dr Leaf, the MIA blogger was intellectually honest enough to attach the source of the table, which was an article published in the European Heart Journal in 2012. While the MIA blogger is certainly entitled to her opinion, I thought it was worth discussing the statistics in a bit more detail, if for nothing else than to give some context to the whole “anti-psychotics kill you” trope that keeps getting around. First, there needs to be the proper context. No one is denying that there’s a higher mortality rate amongst people with schizophrenia and other forms of psychosis, though I don’t see exactly where she got her “25 year lower life expectancy” line from. To me, that seems excessive. Then to the study itself. The paper that the table is extracted from is Honkola et al . The study specifically examines the association between the use of different classes of psychiatric medications with the rate of sudden cardiac death during a coronary event (a heart attack, or angina). In her post, the MIA blogger throws around a lot of numbers but she was loathe to put her numbers in the right context. For example, she claimed that “smoking is four times safer than the older types of antipsychotics. And it’s twice as safe to smoke as it is to take any antipsychotic, including the newer ones”. Except, her comparison is a fallacy of conflation – she’s comparing the all cause mortality of smoking (which is more like three-fold rather than two-fold, just FYI ) with the highly specific ‘sudden cardiac death during a heart attack’ mortality of the study she’s referencing. It’s apples and oranges – the groups aren’t directly comparable. Besides, even if her numbers were directly applicable, the positively immoral sounding four-fold increase in the rate of death sounds is just an association, not a cause. There is a dictum in science, “Correlation is not the same as causation.” Just because two things occur together does not mean that one causes the other. There may be other explanations beside the medication that might explain that number, including but not limited to, statistical anomalies and lifestyle factors, and other factors not considered in the analysis. There are other problems with relevance too. Most of the numbers in the table were small and not statistically significant (that is, could have been related to chance alone). The only strong numbers were for old anti-psychotics, phenothiazines, tricyclic antidepressants and butyrophenones, none of which are first line medications for psychosis or depression anymore. 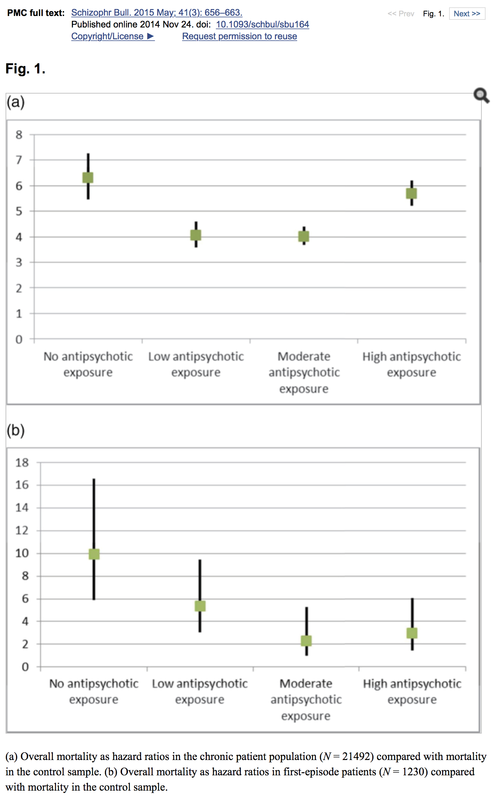 Newer anti-depressants and the newer atypical anti-psychotics did not have a statistically significant association. And, like I said before, this study is looking at the association between sudden cardiac death in people having a heart attack, which is a very specific form of mortality. It’s not particularly applicable to everyone on the medications, so even if the 4- or 8-fold increase is rock solid, you can’t translate that statistic to everyone on anti-psychotic medications or anti-depressants, or Carrie Fisher for that matter since no one really knows how she died other than she had a heart attack. The rest is just disrespectful speculation. In this study, the chance of dying from any cause was significantly higher in those people with schizophrenia who were never treated with anti-psychotics compared to those who were treated. Does this answer the question why there is a lower rate of mortality? Not really, because in fairness, this study also showed just an association between no anti-psychotics and a higher death rate. It doesn’t specifically prove causation one way or another. Does it show that we should throw anti-psychotics around like lollies, or that they are wonder drugs without any associated harm? No, they are medicines and need to be used responsibly. It does show there’s a general benefit to anti-psychotics for people with schizophrenia so they’re not the toxic killers Dr Leaf and the MIA blogger try and make them out to be. Anyone can cherry-pick weak statistics and bend them to suit their self-interested propaganda. The remedy to damn lies and statistics is to look more broadly and consider the strength of the numbers and their context. When we do that with the studies on anti-psychotic medications we see that they aren’t the evil killers that some people would like to make them out to be. We all have a drug problem. Well, we do according to communication pathologist and self-titled cognitive neuroscientist-come-health guru, Dr Caroline Leaf. She’s pretty chirpy for a woman with essentially no health credentials. She did a PhD two decades ago on a specialized area of educational psychology, but she has no medical training or experience. Essentially she is the Christian equivalent of the health and relationships section of a tabloid newspaper. Her information lurches between unfounded and the bleeding obvious. 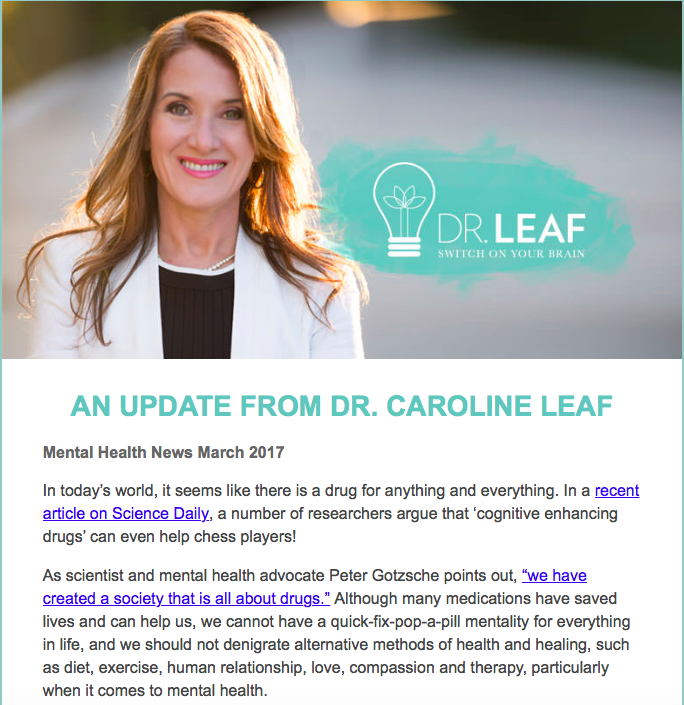 Today’s e-mail newsletter, “Mental Health News March 2017” is a mixture of both. It’s more moderate than usual in its tone, but it’s still inspired by her open rejection of pharmaceuticals, especially medications for mental health which she has railed against many times. She’s right – we shouldn’t have a quick-fix-pop-a-pill mentality, but she overstates her case. Most people don’t want pills for everything – people want good care and good treatment. Sometimes that involves a pill, sometimes it just involves reassurance. This is bread and butter for any good GP, and I’d love to show Dr Leaf what the front-line of medicine looks like if she ever wanted to see (seriously, the offer’s open). And who’s denigrating diet and exercise? Diet and exercise aren’t “alternative” health, they’re mainstream. Is Dr Leaf so out of touch that she can’t see this? Notice how medications do not feature on that list. Dr Leaf is so biased against medications that she is willing to ignore official government data in favour of her own bias. But the truth is, pharmaceutical grade medications have revolutionised our lives. When used in the right way, for the right people, they improve our quality and quantity of life. They give people independence. They give people choice. They help people work, spend time with their family and care for others where that may not have been possible otherwise. Do medications have side effects? Can people feel worse sometimes while taking them? Of course! We need to be realistic. Pharmaceutical medications are powerful agents and we have to use them respectfully. Prescription drugs are like power tools. In the right hands they can do wonders, but they can also be very dangerous when used incorrectly. But while medications can be used incorrectly, using that as a reason why we should use less drugs is like arguing that we should use less knives because sometimes they cut people, or that we should drive less cars because there are car accidents. Oh, and what was that about the widespread manipulation of data and results in the world of science? Dr Leaf would never misrepresent the results of her studies, or misrepresent the results of other people’s research, in order to make her products look better than they are? Lifestyle is important, and in some cases, lifestyle is more important than medication, but there is much more nuance involved. You need different tools for different jobs. Imagine a surgeon going into surgery and the scrub nurse passed over a nerf scalpel. It wouldn’t be particularly helpful would it. Or what if the scrub nurse passed over a butter knife? The surgeon might get the job done but with great difficulty, without the precision needed. There are three different levels of treatment in health – “alternative” medicines, lifestyle treatments, and pharmaceuticals. “Alternative” medicines are, by definition, useless. As comedian Tim Minchin says, “Do you know what they call alternative medicine that’s been proven to work? Medicine.” Alternative medicines are probably not going to cause a lot of harm other than making their user poorer for wasting their time, but they’re highly unlikely to do any good. Lifestyle treatments are the equivalent of the butter knife. They work, but their effect is non-specific and cumulative. Hear me right, “non-specific and cumulative” is not code for “ineffective”. Exercise is one of the most effective non-pharmacological health strategies with clearly proven benefits, but like all lifestyle changes, the effect is fairly general, and the benefit accumulates. And sometimes, despite doing everything right, people still get sick, and this is where pharmaceuticals have their place. They are like the scalpel – they might have some unwanted effects, but in the right hands, when used correctly, they make a specific and tangible difference to a person’s life and health. Dr Leaf then goes on to assert that “Changing your lifestyle and, significantly, the way you THINK can have dramatic effects on your health”. That’s a furphy. Thoughts make no difference to our health (I’ve shown how little difference thought makes to our health in my review of Dr Leaf’s book “Think and Eat Yourself Smart”). Some scientists may have recommended produce over Prozac, but that doesn’t mean to say they’re right. And Dr Leaf has trotted out the same worn, tired old factoid about loving and serving others that I’ve shown to be inaccurate as well. If you want to improve your health without medications, then start walking. Eat vegetables. Drink water. 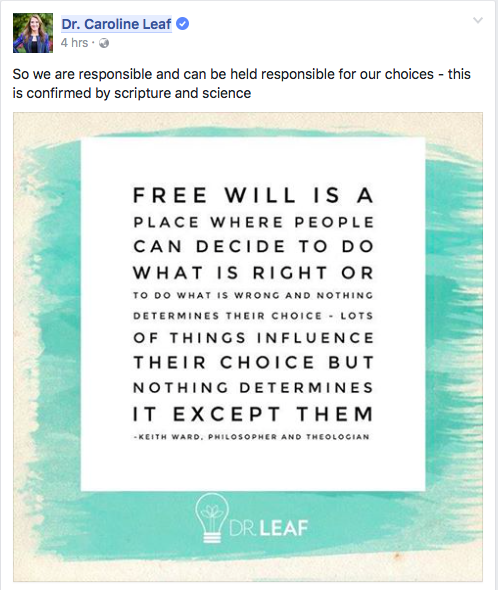 Don’t waste your time and money buying into Dr Leaf’s inaccurate teaching. In the fifteenth chapter of his gospel account, Matthew described a conversation that Jesus had with his disciples. Jesus had just reprimanded the Pharisees for their hypocrisy, and the disciples came back to Jesus to report that the Pharisees weren’t very happy about it. When it comes to many subjects, Dr Leaf is a blind guide. 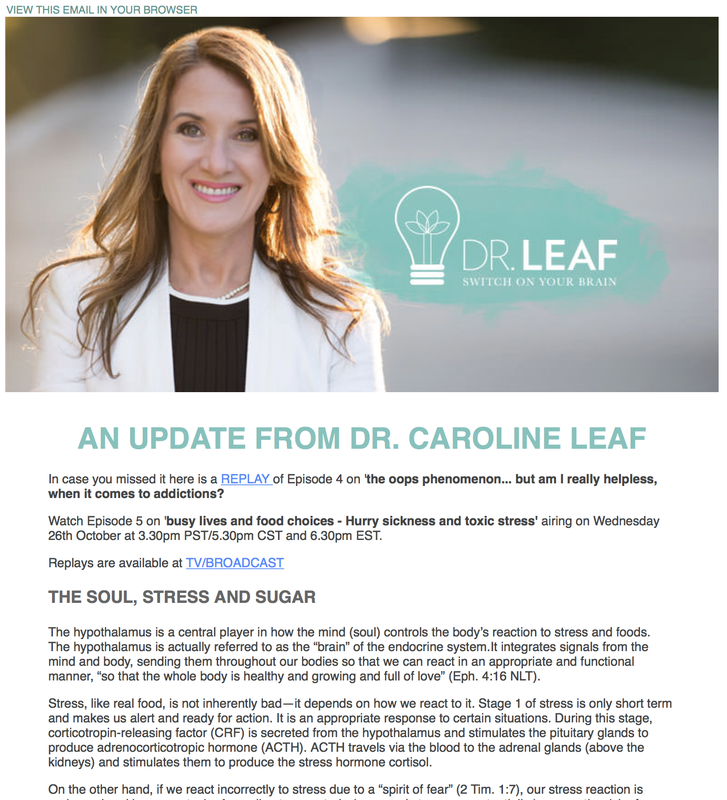 Dr Caroline Leaf is a communication pathologist and self-titled cognitive neuroscientist. She’s not a medical doctor – her title is academic, an award for her PhD in communication pathology over twenty years ago. 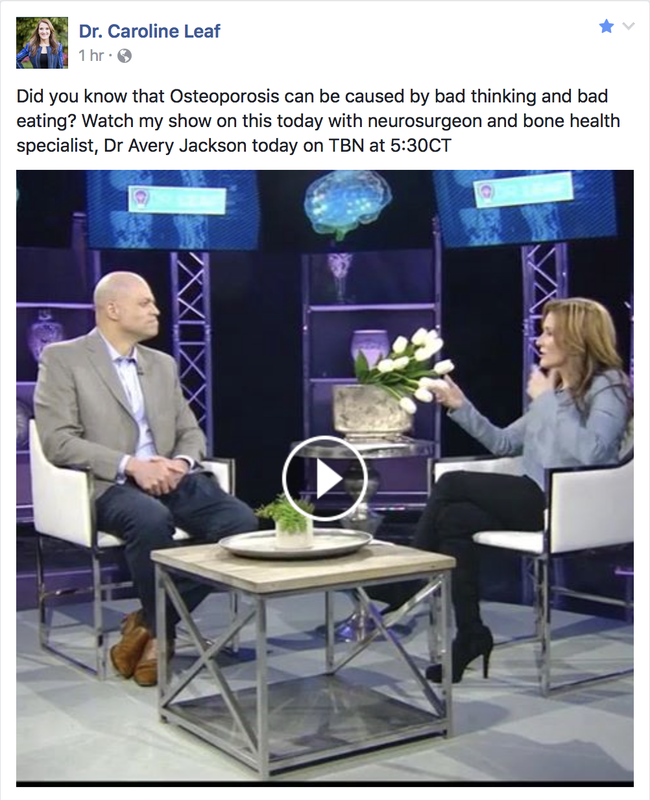 She has no medical training whatsoever, which makes it a little offensive when she feels she’s qualified to lecture people about medical conditions like osteoporosis. In an episode of her TV show broadcast this week, Dr Leaf offered a B-grade attempt at mimicking Dr Oz by trying to use her biased ideology to explain a serious medical condition, and in so doing, gave a performance laden with droll irony, a example of the Dunning-Kruger effect in its purest form. 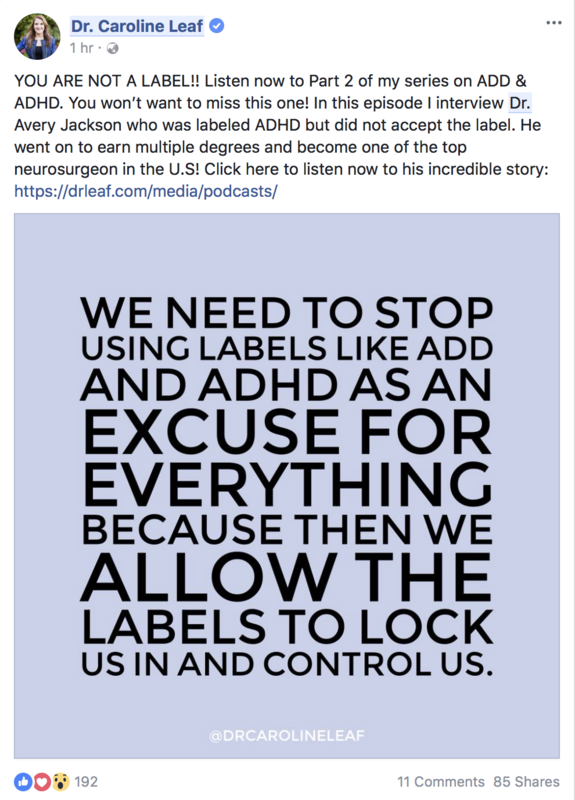 Her co-host was Dr Avery M. Jackson III, a neurosurgeon in Michigan, who Google confuses with Dr Jackson Avery of Grey Sloan Memorial Hospital fame. Dr Jackson has an impressive bio which is replete with advanced work on osteoporotic crush fractures of the spine. One wonders why a specialist of such high regard would associate himself with a scientific philistine who doesn’t understand how genes work, and who regularly contradicts her own position. Actually, the biggest contributors to the risk of osteoporosis are genetics, ageing and the loss of gonadal function (menopause or low testicular function). Which of these are controlled by the mind, Dr Leaf? It’s not that lifestyle has no influence on osteoporosis, but Dr Leaf overstates the case. 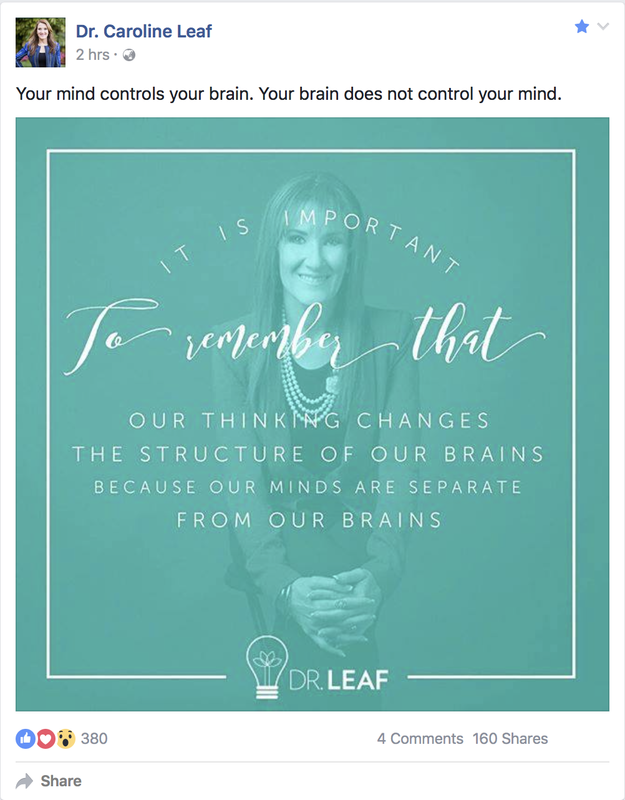 Dr Leaf needs to move on from her unscientific premise that the mind is in control of everything. It’s patently false, and it terminally biases nearly everything she says. She needs to open her scientific eyes rather than staying blind to the truth.